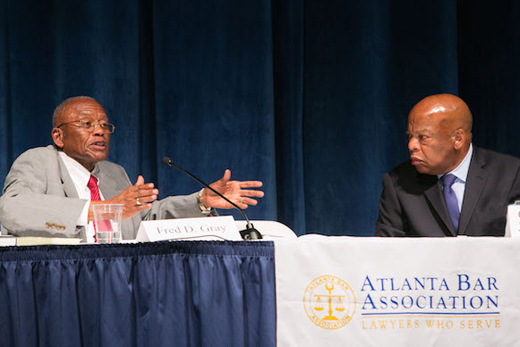 Attorney Fred Gray and U.S. Rep. John Lewis (D-Ga.) reminisced about the early days of the Civil Rights Movement during an Aug. 10 event commemorating the 50th anniversary of the Voting Rights Act. Nearly 58 years ago, young attorney Fred D. Gray, picked up 17-year-old John Lewis from a bus station and took him to meet Rev. Martin Luther King Jr. Last week at Emory University School of Law, the old friends sat side-by-side again — this time in front of hundreds of legal minds — to discuss the state of voting rights in America. Their conversation was part of the Atlanta Bar Association’s Aug. 10 event commemorating the 50th anniversary of the Voting Rights Act. Moderated by Monica Kaufman Pearson, the historic conversation was preceded by a panel discussion featuring five prominent attorneys who share an interest in voting rights cases, including Georgia’s attorney general, Sam Olens 83L. The panel discussion focused on questions about the efficacy of the Voting Rights Act and the potential need for revision. Fredricka Whitfield, CNN News anchor, moderated the event, noting that the VRA was an answer to years of injustices and indignities. She started the discussion by asking panelists a series of questions, including: What was this law designed to do? How is it being used today? How has it changed? How should progress be measured? What’s next? The VRA is still necessary, though it may require a new form to be most effective, argued panelists Debo P. Adegbile, counsel in U.S. Supreme Court case Shelby County v. Holder and partner at Wilmer Hale; Barbara R. Arnwine, executive director emerita of The Lawyers’ Committee for Civil Rights Under Law; and Jason Carter, former Georgia state senator and gubernatorial candidate, and partner at Bondurant Mixson & Elmore LLP. The VRA is “a minority inclusion principle for people who were systematically excluded from our democracy," Adegbile said. He noted that there is still work to be done and that the remedy of the VRA should not last forever, but it also shouldn't end until racism is ended. “We owe Lewis and Gray a great tribute” for what they did to help bring about the Voting Rights Act, he said, adding that the two narrowed the gap between the many “high promises” and “low practices” demonstrated in our country. Olens and attorney Anne Lewis, Georgia Republican Party general counsel and partner at Strickland Brockington Lewis LLP, noted that Congress had failed to update the geographic coverage provisions of the VRA. “Wherever racism is used to diminish minority voting, it is wrong," Olens said, emphasizing the need to address instances of racist voting practices on a national scale. “It’s not 1965,” Olens said, explaining that the systematic poll-blocking that occurred then is not happening in the same way or in the same places. While the panel discussion may have left some questions unanswered and generated new issues for consideration, Lewis and Gray left no question regarding the necessity of the VRA when it was enacted in 1965. The pair told stories about the beginnings of the Civil Rights Movement, starting with a 1945 voting rights lawsuit filed in Tuskegee, Alabama. They provided insight into the days surrounding Bloody Sunday, Turnaround Tuesday and the eventual crossing of the Edmund Pettus Bridge and march to Montgomery. The two spoke as old friends who admire each other greatly. While suggesting people take up the old-school, grass-roots brand of activism, they commented on the current state of voting rights in America. Lewis, who has served in the U.S. Congress since 1987 and received an honorary doctor of law degree from Emory in 2014, argued that requiring people to pay for documents that will allow them to get a required identification card is comparable to a poll tax. People who have been voting for 50 or 60 years without identification are being required to now produce it, he noted. There is more to do for the cause of voting rights, both men suggested — and lawyers can be the ones to bring about the change. He said that he was arrested more times than he could remember, to which Monica Pearson supplied the count: 40. “If it wasn’t for gifted lawyers, I don’t know what would have happened to me," Gray said.